The 3 Best Business Lessons we can all learn from Arnold Palmer! Every single golfer on the planet loved Arnold Palmer! That is a statement I can make with confidence. And Arnold amassed a fortune with his swashbuckling style, good looks, and magnetic personality! But Arnold was smart enough to know that just playing golf and winning money was not enough. So he slowly and methodically built a huge business empire of products all across the spectrum through TV commercials and magazine ads. If you want to learn about business, learn from this great man! Thanks to Tanner Simkins for Entrepreneur for sharing this educational article! 1. Take measured risks, explore new opportunities. At a time when athletes focused simply on their performance, Palmer opted to create a brand out of who he was on and off the fairway. This approach was not only entirely new to golf, it made him one of the most successful athletes of any sport well after his playing days ended. In his lifetime, he earned almost $4 million on the golf course; while earning more than 100 times that off it. In 2013 alone, Palmer made $40 million despite not playing a round of competitive golf since 2006. It was was unheard of for golfers to become household names, but Palmer was the first golfer to successfully break out of the golfing mold and gain widespread popularity among a variety of people. Later in life, Palmer attributed his brand equity to his willingness to stretch his business endeavors outside the narrow realm of golf. Palmer’s business ventures and diverse portfolio of endorsements all flowed through parent company Arnold Palmer Enterprises. This enabled Palmer to put his branded signature on golf clubs, lawn mowers, sunglasses and other products from cardigan sweaters to cigarettes and everything in between. Over the years Palmer was endorsed by Coca-Cola, Rolex, Cadillac, Hertz, United Airlines, Penzoil, Heinz, Callaway and many more. Palmer’s branding genius even extended to his self-made lemonade/ice tea blend dubbed “an Arnold Palmer”; now commercially licensed to AriZona Beverage Co. In 2015, the “Arnold Palmer” beverage alone eclipsed $200 million in sales. Early stage companies can look to Arnold Palmer as a model of effective diversification. Which EquipCo will get Tigers Endorsement? Prizes for the best guess! Tiger is back as the hottest property in golf and he has not even picked up a club and swung it in a competitive round! Wow, that is marketing power! The entire world is abuzz with Tigers announcement that he will “hopefully” return to competitive golf at the Safeway Open in October. With Nike withdrawing from the golf equipment race, who will get Tiger’s endorsement? E. Michael Johnson and Mike Stachura of Golf Digest give us their 6 questions on Tiger and his possible choice of new equipment. I’m giving away a 3 day school at the Mel Sole Golf School, to the first correct guess of which EquipCo that signs Tiger! Just post your comments below and I will award the prize the day of this eagerly awaited news! With the news that Tiger Woods is hoping to return to competitive golf in October, there remains the lingering issue of what clubs he’ll play now that Nike has announced it is his exiting the equipment business. 1. Is Tiger obligated to use Nike equipment when he returns? Not even close. In fact, he’s not obligated to use any of it. Woods, like other Nike staff players, is essentially an equipment free agent, able to play any clubs or ball he chooses (although in order to keep his Nike contract intact, Woods must wear the company’s hat, apparel and footwear). That doesn’t mean that all of a sudden his bag is going to be filled with non-swooshed products. Since Nike’s announcement that it was exiting the equipment arena, some of its players have slowly begun making the transition to other equipment—although none has made a wholesale change. Rather it’s been dipping the toes in the equipment waters with a club here and there so far. Rory McIlroy changed to a Scotty Cameron by Titleist putter as has Brooks Koepka. Russell Henley and Jamie Lovemark each changed to Titleist’s Pro V1x golf ball, with Lovemark also playing a TaylorMade M2 driver. 2. What are the odds that Tiger signs a new equipment deal by the time he returns? You have to look at this question from multiple directions. First, his deal with Nike to wear its apparel and shoes hasn’t changed (and it’s believed to be a figure higher than any other current player’s deal), so financially it would be silly for Tiger to enter into a deal that would force him to walk away from the Nike contract, which is set to expire at the end of 2018. Second and conversely, equipment companies that might be pursuing a club or ball deal with Tiger Woods might find themselves a little hamstrung in that Tiger might agree to use their clubs but he’ll be doing so wearing Nike’s swoosh from head to toe, with no other logos showing. Third, he’s planning to test the competitive waters for the first time in over a year after using and testing only Nike clubs precisely tuned to his peculiar swing tendencies for the last decade-plus. A wholesale equipment change brought on by a new contract signed in the next month seems about as likely as Tiger playing the Ryder Cup as a warmup event. Plain and simple, it’s hard to see how now would be the time to make that kind of change. 3. Yeah, but if he does, who are the contenders? The number of golf equipment companies who might be in a position to pursue Tiger’s asking price on the equipment side is likely limited to Callaway, TaylorMade, Titleist and wild card PXG. Callaway has its old horse Hall of Famer already in Phil Mickelson, TaylorMade is in the midst of a reorganization and likely sale that surely will limit its marketing spend and clearly will be focused on finding money—the kind of money Tiger Woods might be seeking—to pay the likes of Jason Day and/or Dustin Johnson and/or Justin Rose. Titleist? Titleist sued Nike after Tiger’s infamous hackey-sack commercial, when Tiger at the time had contracts with both Nike and Titleist. While those scars have healed, Titleist doesn’t have a track record of signing older players who haven’t been playing their clubs for a while. PXG? Not likely. Company founder Bob Parsons, who indicated he was interested in Rory McIlroy, told Golf Digest last month, “There’s no doubt that Tiger has been an icon in the game, that no one has done as much for golf as anyone in history and he’s highly respected for that, but I don’t know that his game is what it once was.” Which perhaps leads us to one final point: He’s ranked No. 711 in the world, hasn’t played a “full” season in three years, is coming off three back surgeries and the last equipment company he had a contract with just got out of the business. Is this really how you would want to spend some serious marketing dollars? To see the rest of the questions about Tiger and his equipment, go here! 5 Top Reasons to Buy Refurbished Golf Balls! Love #5! Retrieving lost golf balls is a huge business, and Gary Kreuger’s company Lost Balls is no exception. Collecting lost golf balls, cleaning them, repainting them and then reselling them has been a profitable business for Gary. After playing on the PGA Tour for a few years, Gary decided that finding others people’s golf balls was far more profitable and has not looked back since. Check out this interesting interview with Gary, talking about the refurbished golf ball business, presented by Golf Digest Stix! Lost Balls CEO Gary Krueger discusses his business, which captures and resells golf balls at discounted prices. Mostly by contracting divers to go into ponds and lakes at golf courses in 43 states, Lost Balls sold 43 million recycled balls in 2015. In the company’s 24-year history, they’ve recycled more than half a billion balls. CEO Gary Krueger, who played on the PGA Tour in the 1980s, answered five questions from Keely Levins. Ball manufacturers say balls that have been submerged under-perform. The majority of your golf balls come from the water—are manufacturers wrong? Wet golf balls aren’t a bad thing. We’ve done independent testing of recycled and refinished balls with the Iron Byron. And there’s virtually no difference off a driver—just a yard or two. Sometimes the recycled and refinished go further. I think it was more of an issue back when we had balata balls. With liquid centers and winding, if you left them in a hot trunk they’d become egg-shaped. But now with two-, three- or four-piece construction golf balls, you don’t have those issues. How can you make an old ball as good as new? We take balls with discoloration or scrapes, and we take those balls and strip the paint off of them and repaint that surface. This happens in a factory that makes new golf balls—with all the same equipment. The balls are painted, stamped with the original logo and sidestamped with the word ‘refinished,’ so everyone knows. Then the ball is coated with polyurethane to seal it. Cosmetically, it’s brought back to its original condition. It’s not exactly like new, but they perform virtually like new. PGA Merchandise Show from 1954 to 2016. Amazing growth! Next week is the start of the 2016 PGA Merchandise Show, one of the biggest trade shows of the year and certainly the biggest in the golf industry! I go down pretty much every year for 3 reasons. One, I take continuing education classes to keep up with the ever changing world of teaching golf. Two, I get to see all the latest technology as it pertains to teaching. Three, I get to see old friends, go out to dinner and generally catch up. What a great week. This year I will also be attending the “Top 100 Teachers” seminar the two days prior to the start of the show. If ever you get a chance to go down to Orlando, make a point of going to the Orange County Convention Center and visiting the show. It is nothing short of spectacular! Thanks to The PGA of America for providing these pictures. From what looked like a very small start at the PGA National Golf Club in Dunedin, FL to what it has become now is nothing short of amazing. Check out these pictures through the years. Do you use Golf to improve your Business? Golf can build relationships that can last a lifetime! It seems to me that customer golf or business golf is in a big decline. Too bad, because it is such a powerful business tool to help build relationships that will carry over into the sales office or boardroom. To join a golf club and not use it for business purposes is like joining a health club and not working out. I would like to share a story that happened to me, which shows how powerful golf can be when you need something to happen business-wise. I was the Head Professional at Humewood Golf Club in Port Elizabeth, South Africa. I had ordered a consignment of golf caps from the USA. When they finally arrived in SA, I received a notice from the Customs Office that in order to have these caps released, I had to pay for both the caps and the customs duty. This amounted to a fairly large sum of money that I did not have at the time. I immediately requested assistance from my assistant bank manager, a non-golfer, who turned down my request for a loan. If I did not pay for my caps within 1 week the caps would be returned to the US. Playing golf with my bank manager saved my business. A Nightclub, Putt-Putt Course and WWII Bunker all in one! This is the type of place that golfers are going to swarm to! A bar, restaurant and putt-putt in a great setting of an underground WWII bunker! The perfect place for a corporate outing or upscale birthday party, the uses are endless. The next time I am in London, I will definitely seek this place out! Thanks to Matt Grech-Smith for the video and Swing by Swing for the interesting article. Be sure to check out the link below to see additional pictures of this establishment! Swingers – the 9 hole crazy-golf pop-up – was the first venture brought to you by the Institute of Competitive Socialising. Located at Factory 7, Hearn Street, London E1, it ran from September 2014 to February 2015. 9 holes of golf in a ballpark! What a great idea! What a fantastic idea! 9 holes of golf in a ballpark. Not just any ballpark, but Petco Park, the home of the San Diego Padres. Partnering with Callaway Golf, these two corporate giants have come up with a marketing scheme that is a home run! Hitting from 9 different spots within the stadium to designated greens, 144 golfers will get a chance to have some fun! Thanks to Chris Chaney, Wrong Fairway for back9network.com for this fun piece! If you’re a true golf nut, you’ve undoubtedly found yourself daydreaming at a Major League Baseball game about the sport you love. You imagine the perfect lie you’d get on Augusta-like grass, perfectly manicured in the outfield. You do the math that straight away center field, at around 400 feet, seems forever away for a ball player, but really is only about 130 yards and a wedge or 9-iron for you to clear. Well, snap out of that daydream because Callaway and the San Diego Padres have teamed up to create The Links at Petco Park, a 9-hole golf experience that will allow golfers to hit shots from around the Padres home ball park to greens situated in the outfield of the stadium. To check out the rest of how this is going to work, go here! What are the Keys to Reversing Golf's Decline? Having member participation events like a putting contest at cocktail hour, is a way to get the members out and enjoying the experience! Andrew Wood of Legendary Marketing has always been outspoken about how to get a bigger participation in golf at every level of the game. From junior golf to private country clubs, golf needs to be revived and he thinks he has the answers to golf’s decline. One his LinkedIn page, Andrew gives us a unique insight on what he thinks needs to be done. Promoting Junior Golf at the Club level is critical to sustaining growth in the game! Back when I was in the karate business two decades ago I quickly cracked the code on how to attract new customers. I simply changed the story I told. In my school martial arts was not about fighting, fitness or self-defense as every other school of the day was promoting. Instead my school was about personal development, mentally and physically being the best you could be using martial arts as the vehicle. While others talked of sparring and katas I talked of self-esteem and confidence particularly for children. It worked and it worked in a big way, I went form one school to an organization of over 400 in just seven years. That was just the beginning, my personal development story attracted students in droves but they didn’t stay. The average lasting only 3 months before the kids moved on to little league, soccer or swimming. I figured out quickly that if I could just make every student stay another month I’d increase my income by 25%. The answer was a simple one page letter reminding parents of the reasons they signed their kids up in the first place. The letter also talked about the value of persistence and seeing things through at least to their next belt! The results where astonishing, my reminder of the focus, self esteem and improved self-discipline I provided to their children increased my retention and income not 25% as I had hoped but over 50%. How does this relate to declining participation in golf? Business Golf for Women is now more important than ever! Corporate America has been dominated by men for years. But the days of the “good old boys” is slowly but surely coming to an end. Women are running America’s Corporations, sitting on Advisory Boards, and becoming entrepreneurs. Playing golf can be a huge stepping stone into this world. Leslie Andrews, writing for forbeswoman.com ,gives a unique insight into women using golf to climb up the corporate ladder. Woman are finding golf not only a sport but a ladder to corporate success! It’s really not the golf that matters, truth be told. It’s the secret club. It’s the secret language. It’s being in the game, being where decisions are made. And that means being on the golf course. By Leslie Andrews Catalyst, a prestigious research firm dedicated to expanding opportunities for women in business, found that 46% of women surveyed noted “exclusion from informal networks” as the biggest impediment to reaching their career goals, with golf being one of the leading informal networks from which women felt excluded. The obvious question being: Why are women excluded from golf? Are women being purposely excluded, or are women sometimes excluding themselves? The answer to both is yes. Take the most obvious recent case of Virginia Rometty, CEO of IBM. IBM is one of three sponsors of The Masters which takes place at Augusta National, arguably the best and most prestigious golf course in the U.S. Historically, the CEO of IBM is automatically granted membership to Augusta, but not so this year. Rometty, who was named CEO in October 2011, was named one of the Top 100 Most Influential People in the World by Time Magazine in 2012. That wasn’t good enough for Augusta National – as a woman, she was denied membership to the club – the ultimate club for CEOs. But not every golf story of exclusion is as dramatic as that of Rometty and Augusta, yet women still feel excluded from the secret society that is golf. In my experience with executive women, there are two primary factors that keep women off the golf course: intimidation and fear of embarrassment. And while being denied access to Augusta is currently uncontrollable, intimidation and fear of embarrassment are most assuredly addressable with a few easy steps. Starting girls off at a young age provides a strong foundation for the future wherever it may take you! Most importantly, women need to understand that many of their assumptions about what it takes to play business golf are myths, and that those myths need to be replaced by a sense of reality. For example, most women assume that the men who play in corporate outings are good golfers. Not so! Many women assume that the men who play golf do not want to play with women. With a few exceptions, not so! And so it is with golf. The business benefits of golf — primarily the ability to develop relationships and to be where decisions are made — are so powerful that by allowing themselves to be excluded, women are doing themselves a disservice. I am by no means saying that diving into the world of business golf is simply mind over matter. 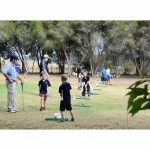 There are some rudimentary skills one needs to play golf – you need to have the ability to get the ball in the air more often than not, and you need to have a basic understanding of rules and etiquette. You do not, however, need to play as well as the LPGA or PGA Tour pros that you see on television each weekend – another myth embraced by women that needs to be crushed. I mean, really, do you think you have to sing like Aretha Franklin in order to make singing part of your life? Woman’s golf has taken a strong foothold in the world of business. Women don’t control the whole equation. The Virginia Rometty episode provided a stark reminder of that. But we do control part of the equation, and it is imperative that we do our part to seize the opportunity that golf affords.